This painting was executed after listening to a song of the late Jamaican reggae musician, Peter Tosh. In his song ‘Equal Rights’, he sings: everybody wants to go to heaven but none of them want to die, I don’t want peace, l want equal rights and justice. 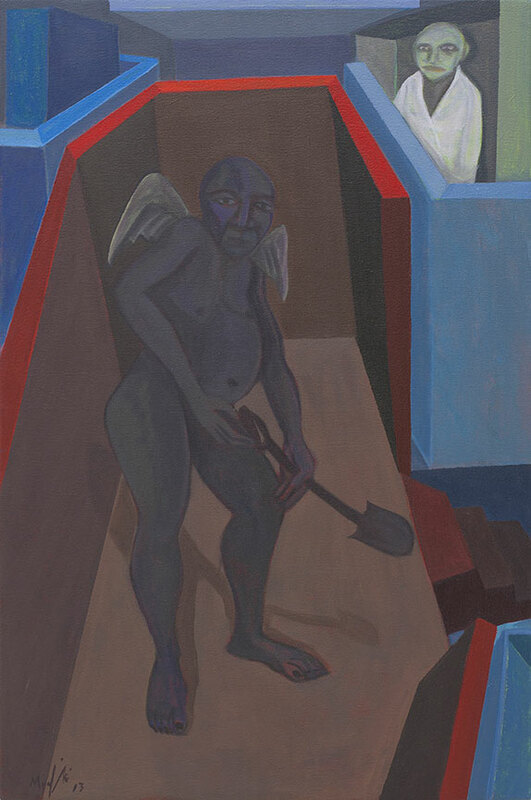 The angel of death waits with a shovel to take us down the stairs of death – there is no escape. Death is final, and in death we will all be equal, but it seems no one wants to die. Could the reason be that we are all afraid of what may happen; what it will feel like (pain or peace); whether there will be a heaven? Although death is a scary concept and unfamiliar territory for most, it is only through death that one can go to Heaven (if there is a heaven) – supposedly the most peaceful place in existence.